« What’s Your “Go-To” Tone? I was perusing The Gear Page this morning, and came across a post about Peter Frampton’s pedal board. Cool stuff on the board! 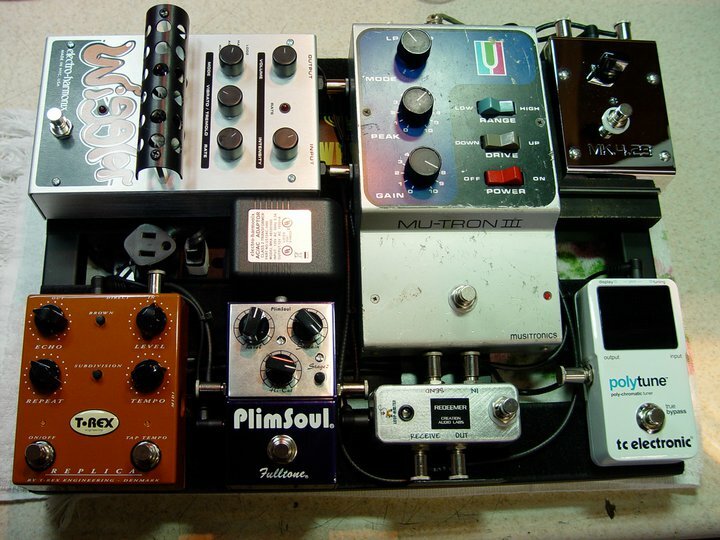 But the pedal that really caught my eye was the pedal in the top-right corner: A Creation Audio Labs Mk.4.23 Clean Boost. Ever since I got one, it has never left my board. In fact, it’s one of the only pedals I have besides my trusty Boss TU-2 that hasn’t been rotated. Here’s my original review of the pedal. Have been following your blog for a while and currently use a Reason Bambino, no thanks to you! Haha. I’ll be getting the Creation Audio Labs MK4:23 boost soon, also no thanks to you and Anthony who suggested this pedal to me when I asked him. What overdrive have you found best with the amp? I play in church mainly but I like music from Switchfoot, Relient K, John Mayer. Hahahahahaha!!! I tell my gear freak friends that it’s expensive being friends with them all the time! Great choice with the Reason Bambino! Anthony was also the one who turned me on to the Mk.4.23. He actually lent me his, and then I got one for myself. As far as overdrive pedals go, well, with the Bambino, I’d get a either a transparent overdrive like the Creation Audio Labs Holy Fire or get an overdrive that adds some bottom end like the Doodad Overdrive/Booster or the Tone Freak Effects Abunai 2; both of which are on my board. The Kasha OD works great as well. I’d avoid getting an overdrive that has a midrange hump like the Tube Screamer and TS clones because the Bambino is already very midrangy; however, even though it’s a TS clone, I highly recommend the DigiTech Bad Monkey, which is a fantastic OD that has both bass and treble controls that’ll let you really dial in your OD tone. All that said, you might just want to think about using just the booster. Set the Bambino in Stack mode, just at the edge of breakup, then use the booster to get your overdrive tone. The Bambino will deliver the goods with overdrive. Note that that might be a bit loud, so I suggest using an attenuator – especially in church – to keep your volume down, but allow you to crank the amp. I got my Creation Audio Boost and dang! It sounds really great! Preserves the tone from the amp, super duper transparent! I’m happy! Got a OD too, it’s called the XTS Precision Overdrive, it is TS-like but I feel that though it doesn’t sound great at home, when playing loud, a little mid range hump helps, plus, I may not play my Reason out so yeah, pretty good going into Fenderish amps I think. Got a Timmy on the way, ordered back in June so hoping to receive it early Dec! Thanks again! And keep up the writing! PS: The fulltone plimsoul looks darned nice – but I’m in Oz and fulltone pedals are very very pricey. Anyway, I’m pretty set overdrive wise. Very good to hear. What you need next is a great attenuator, like the Aracom PRX150-Pro or -DAG. It’ll cure your OD GAS because you can crank up your amps. Then you discover just how awesome an amp like the Bambino can be live at 8 Watts.